I wake up this morning and walk into the kitchen. Oh, way to go, Lynne! You’ve done it AGAIN!!! Good thing nobody decided to light up a cigarette during the night (not that any of us smoke, but you know), we would have had a wee little problem. The house probably would have been lit up like the 4th of July, and not in a good way! Yes, after making last night’s dinner and sauteeing that delicious spinach on the stove, I neglected to, uh, turn the burner off. So, it was on low all last night. This certainly isn’t the first time I’ve done it, but every time it happens, I’m always hoping it will be the LAST. I witnessed something wonderful today as I was driving to the store. A teacher, I know this because I’ve seen her working at that school she was driving to, was singing in her car. I pulled up at the stop light a lane away from her and glanced over her way. And she wasn’t just singing. Her head was bouncing, she was moving it from side to side, and she even had the hand movements going! She didn’t have a care in the world, didn’t care who was watching her, she was just gettin’ down. I really wanted to know what song she was listening to! Wow, I hope she brings that excitement and energy into her classroom. What a great teacher she must be! I adapted this recipe from Cooking for Seven. When I first read Erica Lea’s blog title, it freaked me out because I thought she was cooking for seven kids! I wanted five then shortly after we were married Mr. 365 and I saw a mother with 5 kids in a grocery store and that quickly changed my mind. The original plan was that we were supposed to have two boys, a girl, and two boys. Yeah, we know how that goes, you don’t get what you ask for. We started out with two girls and then had the boy. Now we’re just waiting on grandchildren. Which hopefully won’t be anytime soon. Erica Lea grew up being one of seven children and learned to cook for her brothers and sisters. What a great way to start cooking! 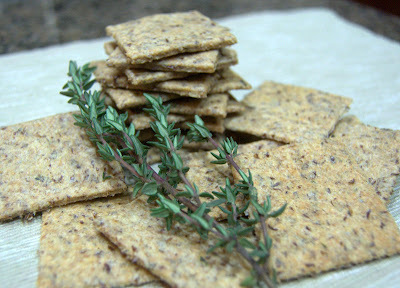 In a large bowl, whisk together flours, flax seed meal, ground walnuts, Parmesan cheese, sugar, thyme, salt and paprika. With a pastry cutter, cut in butter until it resembles coarse meal. 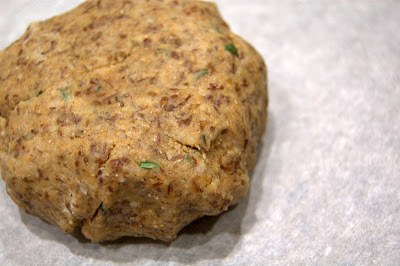 Gradually add milk and stir with a wooden spoon until dough comes together. Use your hands to combine the rest of the dough. Using 1/3 of the dough at a time, roll it out sandwiched between two pieces of parchment paper until dough is about 1/16-inch thick. Carefully peel away top piece of parchment and save to use for next batch. Don’t worry about the wrinkles. 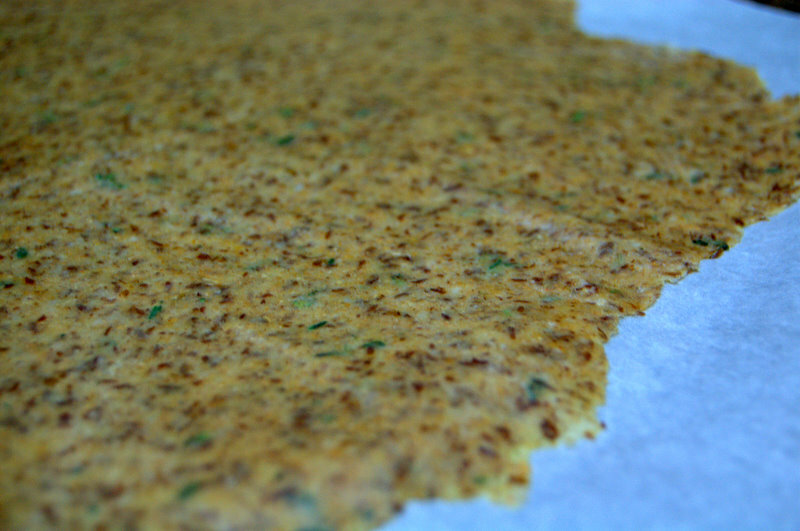 It all flattens out while baking. 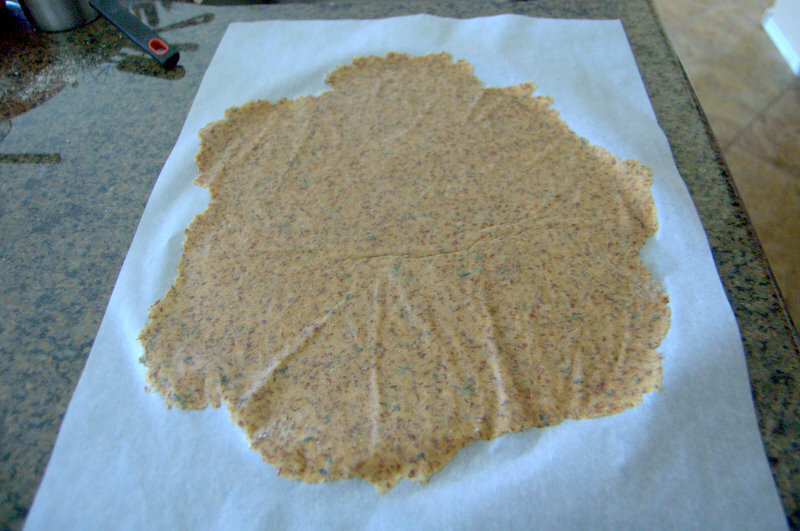 Transfer parchment with cracker dough to a cookie sheet. 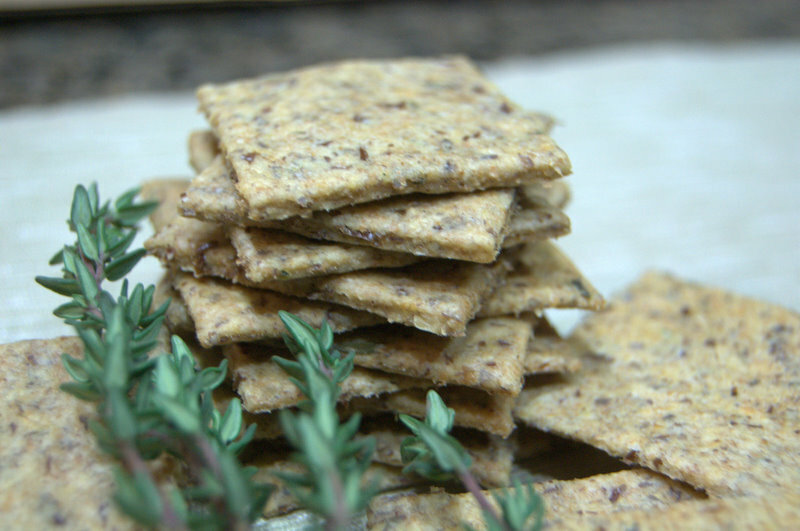 Using a pizza cutter, cut crackers into squares. Bake for 18 minutes, just until golden or when edges are lightly browned. 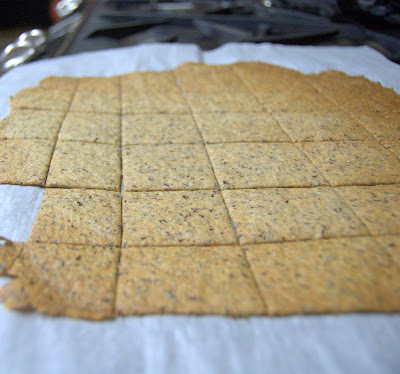 Transfer parchment to a wire rack to allow crackers to cool. I rate everything I bake on a scale of 1-4 and these Homemade Wheat Crackers earned 2 1/2 rolling pins. The first batch I wasn’t too nuts about because all of a sudden, my oven has decided that it’s going to cook things in the amount of time they’re supposed to be cooked instead of taking like 5 minutes longer. So, thinking that I had a few minutes extra when the timer went off at 18 minutes, I dilly-dallied in making my way to the oven. I think they tasted best when the edges were just becoming slightly golden. The middle cookies, or rather crackers (guess I still have my 12 Days of Cookies on my mind), were nicely baked and had a nice taste and texture. Yeah, don’t over bake them. And you can get creative and put different spices in them and sprinkle things like salt, seasonings and cheese on them if you like. Go for it! Live dangerously. Dance in your car like nobody’s watching. Fantastic idea. A great homemade addition. Ooh, these look good! I really want to make them, but my son is severely allergic to walnuts. Any ideas for something I could substitute? Thanks! Anita, I’ve used ground almonds in some other recipes and really liked the flavor, so you might try those or is he allergic to nuts in general? If that’s the case, then adding an extra 1/4 cup of the flax meal or another ground seed might do it.I’m not a professional , but those aare my best guesses. Please let me know how it goes!